I’m so excited that we’ll be having fantasy week here on my blog. Check back each day for a post by wonderful fantasy authors Lynn Flewelling, D.B. Jackson, Steven Harper, Kalayna Price and N.K. Jemisin with a chance to win signed copies of their books! To kick things off, I want to start with a huge congratulations to epic fantasist Carol Berg, whose THE SOUL MIRROR won the 2012 Colorado Book Award for Genre Fiction this past weekend! 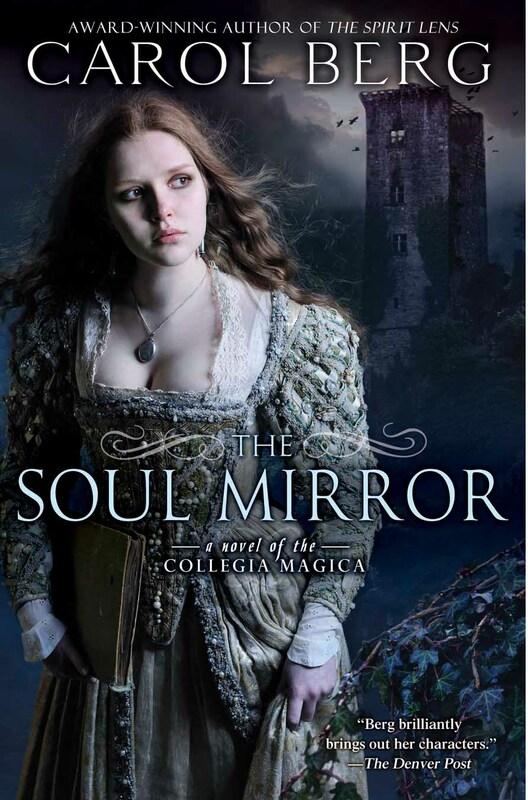 THE SOUL MIRROR is the second novel in the author’s amazing Collegia Magica series (which starts with THE SPIRIT LENS and ends with THE DAEMON PRISM), and well worth the read. 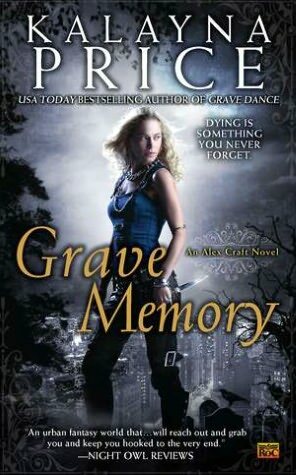 GRAVE MEMORY (out July 3rd) is the third novel in Kalayna Price‘s USA Today bestselling Alex Craft series, which has sold in the Czech Republic, France, Germany, Poland, Romania, Russia and Turkey. So excited for this new release! Blurb: As a grave witch, Alex solves murders by raising the dead—an ability that comes at a cost. After her last few cases, that cost is rising. But her magic isn’t the only thing causing havoc in her life. While she’s always been on friendly terms with Death himself, things have recently become a whole lot more up close and personal. Then there’s her sometime partner, Agent Falin Andrews, who is under the glamour of the Winter Queen. To top everything off, her best friend has been forever changed by her time spent captive in Faerie. 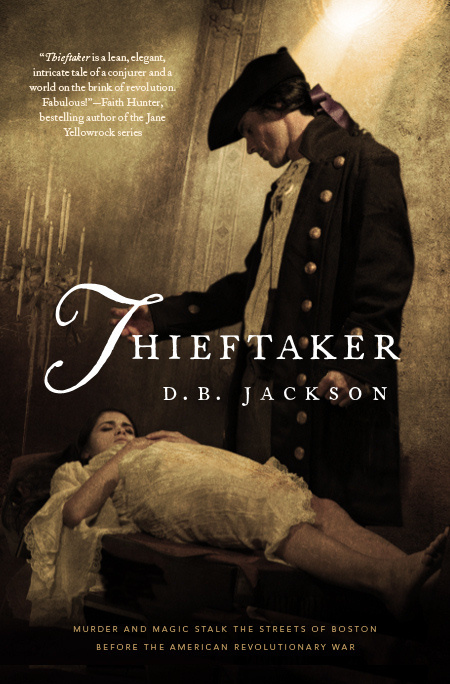 THIEFTAKER (out July 3rd) by D.B. Jackson kicks off a brand new fantasy series featuring history, mystery, magic and murder. Something for everyone! Blurb: Ethan Kaille, a thieftaker of some notoriety, and a conjurer of some skill, is hired to find the killer of a wealthy young woman. Soon he is swept up in a storm of intrigue and magic, politics and treachery. The murder has drawn the notice of the lovely and deadly Sephira Pryce, a rival thieftaker in Boston; of powerful men in the royal government; of leaders of the American rebels, including Samuel Adams; and of a mysterious sorcerer who wields magic the likes of which Ethan has never encountered before. To learn the truth of the girl’s murder, Ethan must recover a stolen gem and sound the depths of conjurings he barely understands, all while evading Sephira and her henchmen, holding the royals and rebels at bay, and defending himself and those he loves from the shadowy conjurer. No problem. Provided he doesn’t get himself killed in the process. 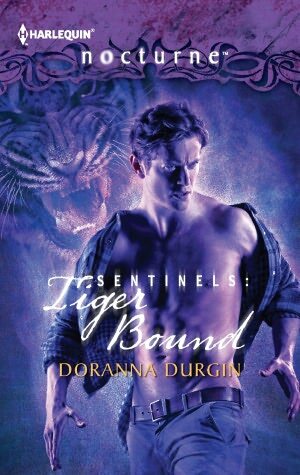 TIGER BOUND (out July 24th) by Doranna Durgin is the latest in her wonderful Sentinels paranormal romance series for Harlequin Nocturne. Alpha heroes, danger, romance, suspense…yup, true love. and much too tempting for Maks. 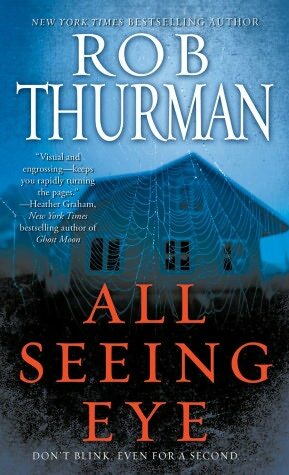 ALL-SEEING EYE (out July 31st) by Rob Thurman is a dark, tense paranormal thriller that will keep you on the edge of your seat. This is a move into the mainstream for Rob Thurman, but never fear – fans of her bestselling Cal Leandros, Trickster and Korsak Brothers novels (CHIMERA and BASILISK) will find lots to love! Blurb: The New York Times bestselling author of the Cal Leandros series delivers a bold new supernatural thriller where one man’s extraordinary abilities come with an equally phenomenal cost. HEX APPEAL, edited by P.N. Elrod – because I missed giving the amazing HEX APPEAL anthology a happy book birthday shout out at the time, I want to mention this here now as well. Lots of phenomenal writers, no waiting! HEX APPEAL has stories from Jim Butcher, Carrie Vaughn, Ilona Andrews, Rachel Caine, Carole Nelson Douglas, Simon Green, Lori Handeland, Erica Hayes and P.N. Elrod herself. You don’t want to miss this anthology! There now, I hope I’ve whetted your appetite both for fantasy week and some new and upcoming titles. See you back here soon! Lynn Flewelling Guest Blog with Giveaway!